It was Thanksgiving Night in 1987 at the first ever Survivor Series. 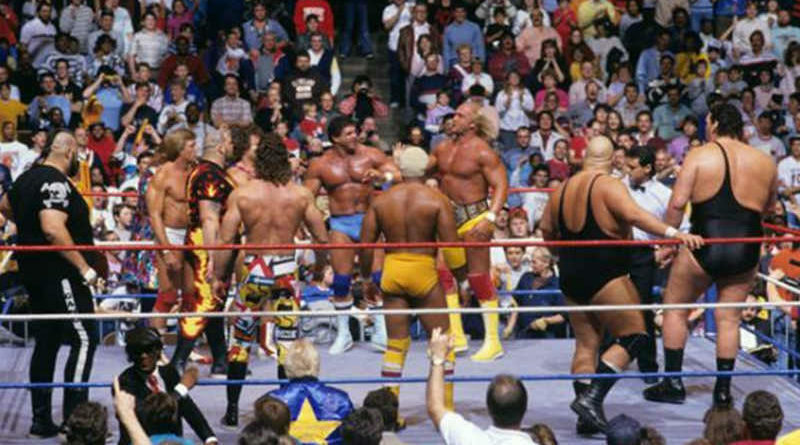 In the main event, Hulk Hogan would captain his team of 5 against Andre The Giant, who was the captain of his 5-man team. This was billed as Andre’s first match since Wrestlemania III after suffering his first ever loss at the hands of the Hulkster. I’m quite excited for tomorrow night being the 30th annual Survivor Series. Over the years, the Survivor Series has changed formats multiple times from its original awesomeness of the elimination match. I’m really glad to see that the 30th annual is following a very similar format to the original. Going back to the original 5-man teams, including a tag-team elimination match, and a 5-woman elimination match. 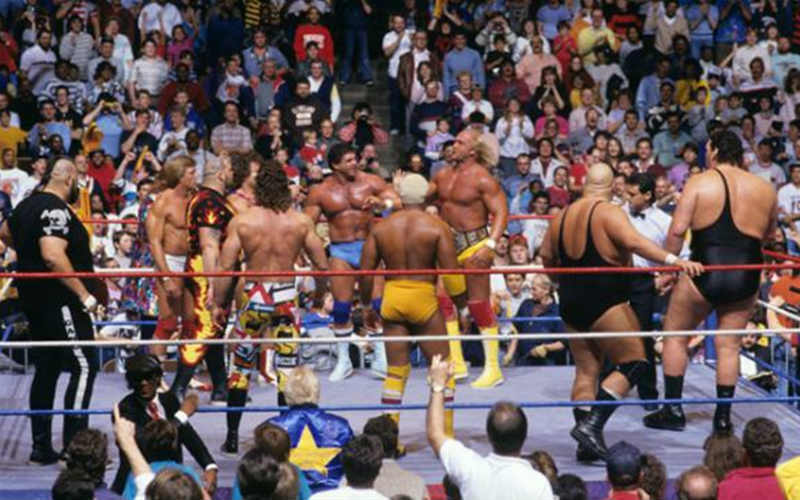 Returning back to the first ever Survivor Series, the main event was team captain Andre The Giant teaming with One Man Gang, King Kong Bundy, Butch Reed, and Rick Rude against team captain Hulk Hogan teaming with Paul Orndorff, Don Muraco, Ken Patera, and Bam Bam Bigelow. The match started off quick. Butch Reed was the first man eliminated when Hulk Hogan came in and dropped his big leg getting the three-count. The crowd was going crazy and Hogan was filled with intensity. As Butch Reed left the ring, Andre stepped over the top ropes, much to the crowds delight, who were thinking they were about to see a Wrestlemania III rematch with Hogan facing off against The Giant. Hogan, with his adrenalin rushing, had turned his back on the other team and began a high-five sequence with fellow teammate, Ken Patera. Afterwards, he went in turn to each teammate and hugged them. The referee, seeing the high-five take place, forced Hogan out of the ring. Hogan and the ref would argue that it wasn’t a tag, it was just a high-five. Ken reassuring Hogan that he got this, stepped into the ring to challenge Andre. Andre tagged in the One Man Gang and the crowd was left disappointed. Of course, the WWF did a great job keeping Hogan and Andre apart to further build on the company’s massive success from their Wrestlemania III match. After Ken was tagged in via the aforementioned high-five, he would be eliminated shortly after. Paul Orndorff was then the next man to be eliminated making it 3 against 2 for Andre’s team. Bam Bam then entered the ring, and in what is now classic Survivor Series action, Bam Bam was being man handled while Andre’s team would make frequent tags maintaining the advantage. With Andre in the ring, Bam Bam finally ducked under a punch and made the hot tag to Hulk Hogan. Finally! Hulk and Andre in the ring at the same time. Hulk gained a quick advantage over Andre as the crowd was going nuts. It was short lived because Hulk was pulled outside the ring where King Kong Bundy and The One Man Gang continued to attack him. In classic Hulk fashion, he was able to overcome the odds, slamming both the big men outside. Meanwhile, the referee counted Hulk Hogan out and he was eliminated in a big surprise turn of events leaving Bam Bam alone against the 3 monsters. And leaving the crowd wanting more Hogan vs Andre. Bam Bam put up a valiant fight: first eliminating King Kong Bundy, then the One Man Gang, making it one-on-one against Andre. Shortly after, Andre got the win over Bam Bam making him the winner and sole survivor for his team. Hogan, feeling cheated, came rushing back to the ring after Andre won clobbering him with his WWF Championship furthering his feud with Andre. This of course was a great setup to the events of 1988 where Hogan would lose the belt in controversy to Andre setting up their rematch at Wrestlemania IV in the tournament for the then vacant championship belt. Wrestlers have high-fived each other before and the referee has NEVER made it count as a tag. Someone being counted out happens at every Survivor Series, as well. It happened at the first two (Duggan, Race, The Rockers, The Brain Busters).